For your comfort and piece of mind, we offer two excellent warranty plans. 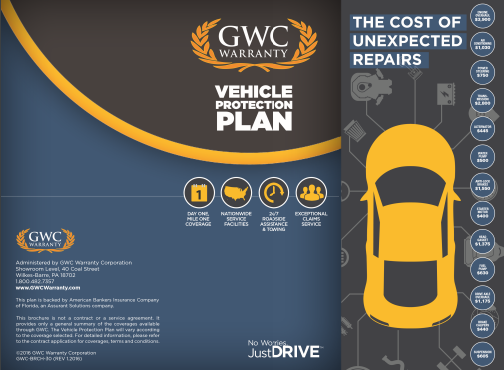 Depending on the type of coverage, warranty pricing is based on the year, make, model and mileage of the vehicle as well as the term of coverage. Engine, Seals & Gasets, Transmission, 4 & All-Wheel Drive, Drive Axle coverage. Includes all Powertrain Plus and Essential. Engine, Seals & Gasets, Transmission, 4 & All-Wheel Drive, Drive Axle coverage, Air Conditioning, Brakes, Cooling, Electrical, Fluids, Steering, Suspension, ABS, High-Tech Electrical, Turbo Charger, Optional Upgrades.